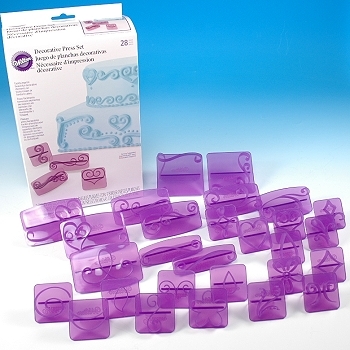 28-Piece Decorative Press Set, easily imprints beautiful decorative elements on buttercream or fondant cakes. 2 corners, 9 borders, 17 icon presses. 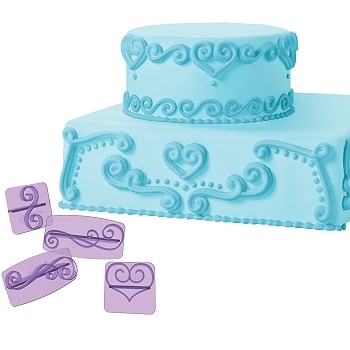 Each press creates an elegant design imprint onto icing, but use them together to create elegant cake designs. With very light pressure, press design onto the side or top of cake to leave a slight impression. With a decorating bag and desired tip, pipe over design with icing. When using buttercream, let the icing crust 15 to 20 minutes to make imprinting easier.